Greenwood Nursing offers the largest number of private rooms in this area. All rooms designated for the rehabilitation unit are equipped with flat screen TV’s, digital cable and free Wi-Fi access. All of our residents enjoy the comfort provided by adjustable electric beds. This facility also offers suites that include private showers. Guests are encouraged to visit at any hour and overnight guest accommodations can be arranged for residents in private rooms. We encourage families to decorate the rooms to make our residents feel comfortable by being surrounded by familiar objects. Greenwood Nursing and Rehabilitation Center is a smoke free campus for all residents, families and staff. 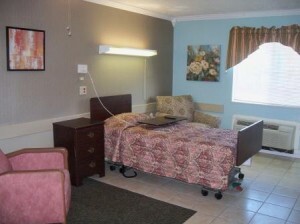 Greenwood Nursing and Rehabilitation Center has three lovely multi-function rooms. Each serving different needs for the Residents of our facility including being dining areas. 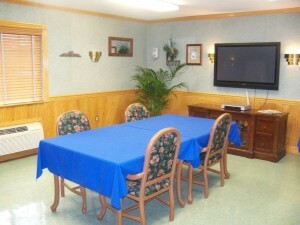 The facility also offers a private dining room as a meeting area for large families or groups. Meals of my Choice Dining is a dining room and menu program, initiated to address our residents’ concerns over food choices. It is a Person Centered Program that encourages independence, socialization, and community for the high functioning resident. Meals of my Choice Dining allows our residents to pick what they eat, when they eat and with whom they eat. The residents are able to choose from a four-choice menu for breakfast, lunch and dinner. The meal may be ordered for ‘room service’ or served in the dining room complete with fine china and cloth napkins. In addition, there are other options offered 24 hours a day, seven days a week. Good nutrition is important for continued good health. We understand that our residents have differing tastes and are accustomed to varied meal times so we make an extra-special effort to be flexible while meeting their nutritional needs. Greenwood Nursing and Rehabilitation Center has a program of activities to promote the physical, social, mental and spiritual well-being of our residents. Our planned recreation expands the daily lives of our residents by giving them the opportunity to stay active, motivated, and stimulated with exciting and enjoyable events. While in our care we ensure that our residents maintain and enhance their quality of life; it is important that they remain independent through varied and meaningful activities. Regular activities include: Church Services, Bingo, Birthday Parties, Crafts, One-on-One Activities and Small Group Activities. We also offer specialized activity programming for our residents with dementia or other special needs.